Asian salads, with their tangy, light dressings and refreshing vegetables are nearly impossible for me to resist. I could eat one every day. Here on Swirls and Spice I’ve shared several of my favourite salads, including Sesame Orange Napa Cabbage Salad and last week’s Sesame Black Bean Salad. This latest recipe is ultra light, thanks to the potato starch noodles which are filling but low in calories and carbohydrates. For me, this salad makes a perfect foil for heavier favourites, like Vietnamese Roasted Chicken or Inside Out Potstickers. 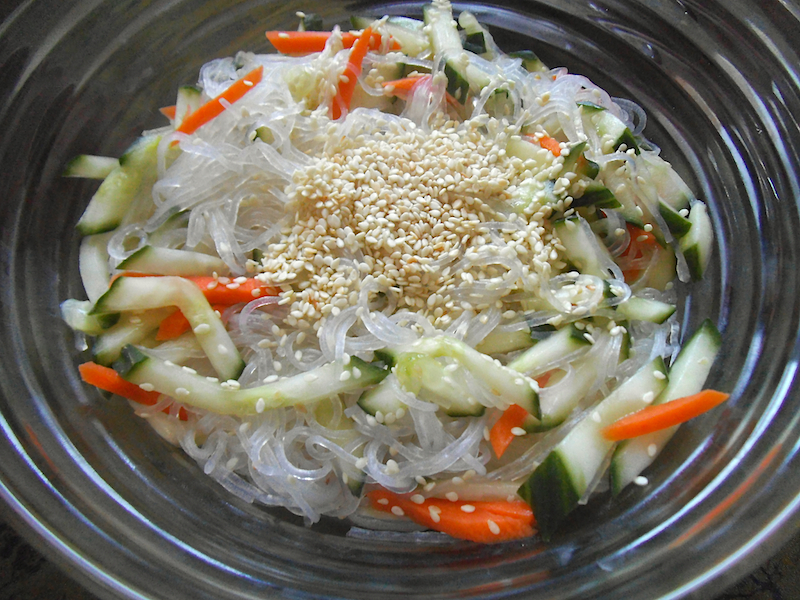 The idea behind this salad was to combine two of my favourite dishes–Korean chap chae and Chinese liang cai. My hope was to create a salad that I could love as much as Tangy Cucumber Salad with Peanuts, which I will gladly trade dessert to eat. It’s that good. 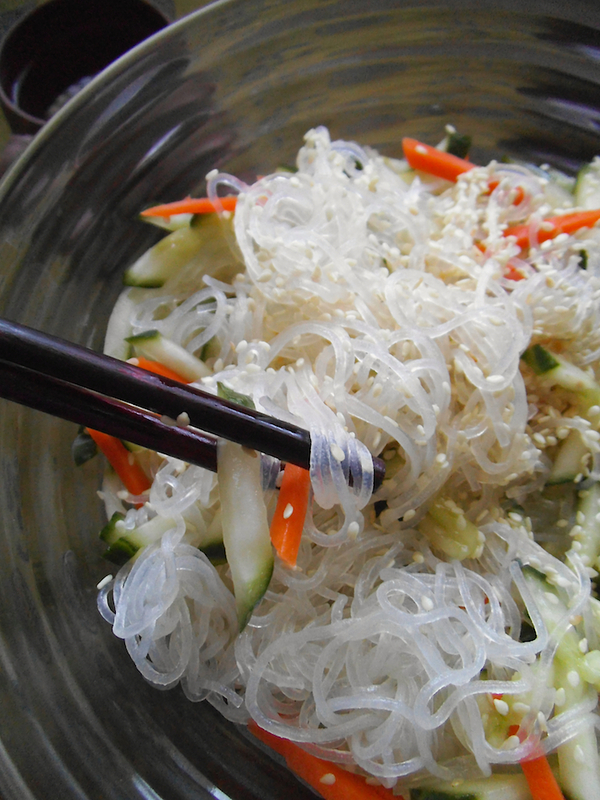 And this new noodle salad? It’s just as delicious. If you’re not sure about that, you can make both salads and see which one you prefer. I think you will find yourself in a win-win scenario. Bring a medium or large pot of water to a boil. Break bundles in half to shorten noodles, if desired. Cook dry noodles for 2 minutes in boiling water. Turn off heat and let the noodles sit in the hot water for 3 more minutes. Drain and rinse noodles in cool water. Toss together the cucumber and carrot with 1 teaspoon salt and set aside. In a small bowl, mix together sesame oil, rice vinegar, fish sauce, sugar, and 1/4 teaspoon salt. Pour sesame dressing over noodles and toss to coat. Add cucumber mixture and toss to combine. Top salad with toasted sesame seeds prior to serving. Serve chilled or at room temperature. Also linked to Allergy Free Wednesdays and Gluten Free Wednesdays. This salad looks so fresh and delicious! I love everything in here – especially the bean thread noodles! Pingback: Vegetarian, Gluten-Free Roundup: Citrus or Banana + Chocolate? Yum, this looks tasty! I haven’t been a fan of bean-thread noodles in the past, but your recipe gives a reason to try them again!